I’ve had a real craving for chilli con carne over the past few weeks. Probably due to the combination of the cold weather and the fact my previous effort on the chilli front really didn’t hit the spot. It was a rather disappointing, lack-lustre, watery and, dare I say, tasteless affair. I’ve been on the hunt for a chilli recipe with a little more oomph ever since. 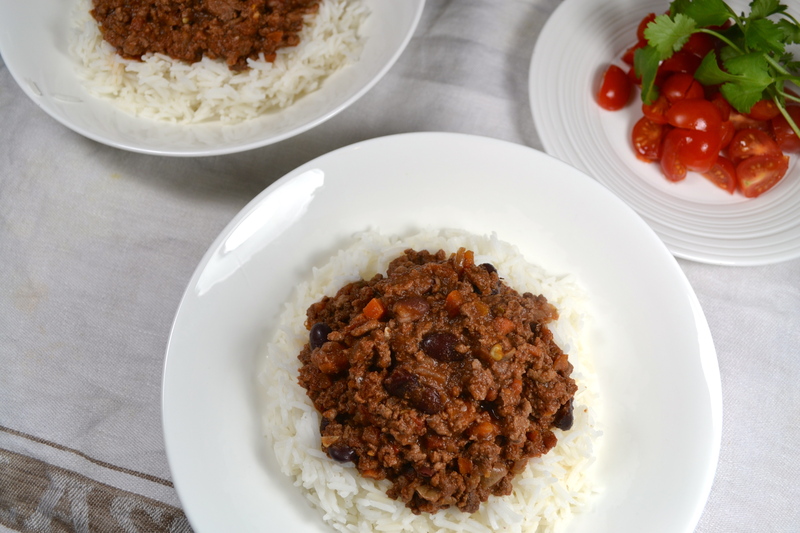 Luckily I stumbled across a couple of recipes that seemed to offer exactly what I was after – a hot yet slightly sweet chilli with plenty of meatiness and no watery sauce in sight. The first recipe is from a fantastic blog full of delicious recipes and beautiful photographs called Two Red Bowls. The recipe sounded like the ultimate chilli with oomph with all boxes ticked: Lots of chilli and spices. A high meat to bean ratio. A healthy dose of sugar. A square or two of chocolate. Hold on. “A square or two of chocolate”?? You might be thinking I’ve lost my marbles (particularly after the peanut butter in soup incident last week). Chocolate and sugar?? In a seriously savoury dish?? Yes, she cries! It really works! You can’t actually taste the chocolate. It just (and to quote Two Red Bowls) really ties everything else together. Sadly health kick January meant no chocolate on hand in the flat though, so I swapped in some cocoa powder instead and result was still divine. The second recipe is from the Smitten Kitchen and follows a similar theme but include a few extra spices. I ended up using a combination of the two recipes to create my version and the finished result definitely hit the spot this time. Definitely a chilli with oomph! 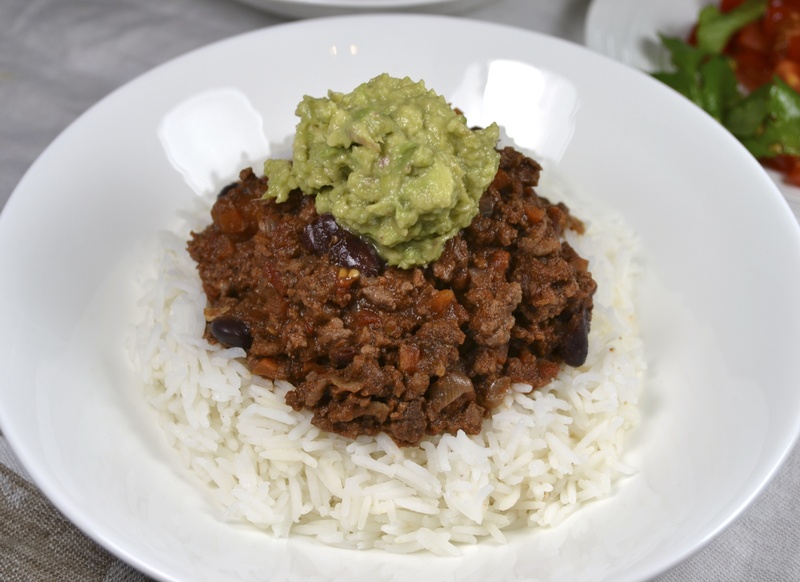 Served with rice, a dollop of guacamole and sour cream, some coriander, fresh chopped tomatoes and cheese to top it off, this chilli is definitely a winner and one to warm you up this January. 1. 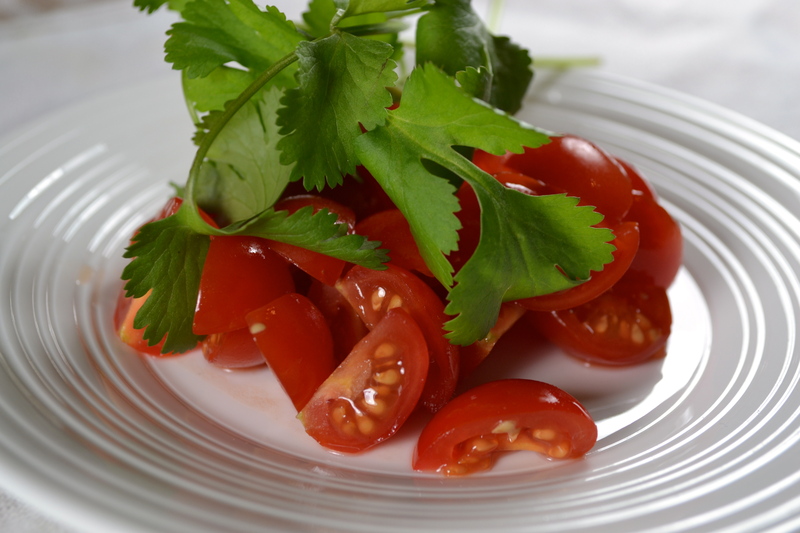 Heat the oil in a large saucepan or casserole dish and cook the onion and carrots for 10 minutes until softened. Add the garlic and chilli and cook for another couple of minutes. 2. Add the cumin, paprika, chilli powder, and oregano and heat for a minute before adding the mince and browning over a high heat, stirring to break up any lumps and ensure there is no pink meat left. 3. Add the cocoa powder, sugar, tomato puree, chopped tomatoes and stock and stir through. Check for seasoning and add a little salt if required. Bring to a simmer and then cook over a low heat for 45 minutes, stirring occasionally. 4. After 45 minutes, add the kidney beans and simmer for a further 30 minutes. Serve with rice. 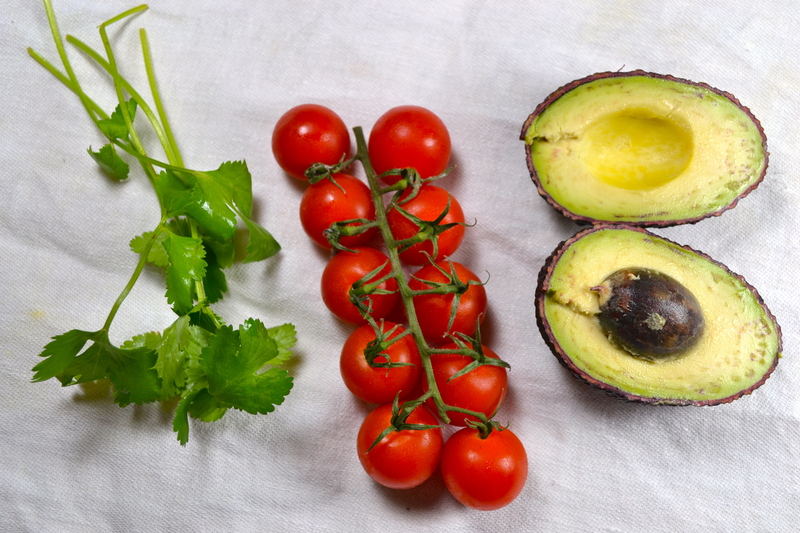 Guacamole, fresh chopped tomatoes, coriander, cheese and sour cream are all excellent additions! This gets even better if made a day in advance so the flavours have time to mull. Thanks Two Red Bowls! It really was delicious – I’m going to try using actual chocolate next time as I’d be interested to see the difference. I imagine you probably do get a bit more chocolately-ness with it so I’m sure you weren’t imagining it!